1. Start preparation early! Packing can take a long time and getting things done early can ease the stress of moving! Make a to-do list that organizes things clearly so you know where you need to be and what you need to be doing at specific times before the big day. 2. Book early! 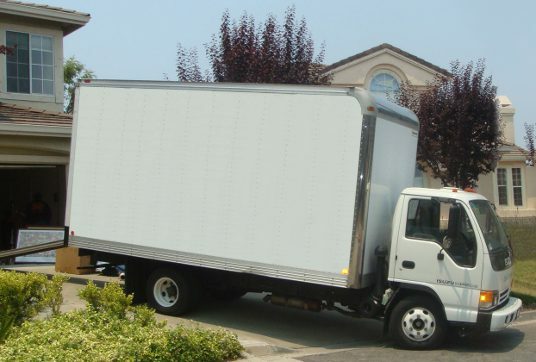 Moving is something that everybody wants to do at the same time, and if you wait until the last minute, you may not get the times or the movers that you would like. Remember that you may have to co-ordinate with your building manager about reserving the elevator as well. 3. Pack everything you can into boxes! Or tote bins with lids. Try to fill each box and close them so they can pack well and are more efficient to move around. Some soft items can also be packed into strong plastic garbage bags, but don't use parchment-thin dollar-store garbage bags. Frogbox offers an excellent, eco-friendly alternative to scrounging for cardboard boxes. 4. Are some things going and some things staying? Some things going to the new place and some into storage? It's a good idea to mark things with something easily identifiable so that there's no doubt what has to be moved and where. A jiffy marker is invaluable for your own organization as well as for the movers. Coloured tape also works well, or even post-it notes in a pinch, although they are prone to fall off. Marking boxes for individual rooms can help you as well, so we can be sure to put all the kitchen boxes in the kitchen, master bedroom boxes in the... you get the idea. 5. Organize your utilities! Who wants to move into the new place only to find the lights aren't on and there's no heat? Get in touch with your providers for phones, tv, electricity and any others so you won't be without your media for a minute! Make sure the movers have a way to contact you that won't be cut off on the day of your move! 6. Keep essential items with you! It is good practice to make sure that a few critical items are kept separate. Things like keys, your cell phone and charger, medication, wallet, passport (if moving out of the country,) lease agreements and other paperwork. These are the things that you will need on the day of the move, and if they are packed away in a box somewhere, they may not be easy to access. Think about the needs specific to you and your move. 7. Is everything going to fit? Experienced movers know a few tricks about fitting a big couch into a small doorway, but there are certainly limitations. Are you moving into a smaller place? Do you have plans for the furniture that there won't be room for? Your movers may be able to take some items to a second-hand store or find some other solution, but please let them know in advance. 8. Are there special procedures for your building? Often elevators must be booked in advance, outfitted with pads, and a used to move furniture in and out. Your building manager will also have advice on where the moving van can be parked, and other helpful hints specific to your building. 9. Parking the Truck? Think about where the moving truck will park while loading and unloading at the two locations. Can you reserve a spot to make it easier and quicker? Can you ask your neighbour to move the car that is blocking the best loading point?